Your home is your sanctuary, your protector, and your bedrock of stability – in the most literal sense of the word. As the core of your house, the foundation is the platform on which everything above rests. Thus, a solid, healthy foundation is critical to the long-term structural integrity of your property — a property that can come under siege often when living in such a seismically-active region as California. Cracks and other areas of weakness in the foundation can spell disaster. Knowing what the warning signs of foundation problems are early on can help you avoid the need for costly foundation repair in Los Angeles. Just as your foundation is one of the most essential components of your home, it’s also one of the most expensive to repair. Many red flags aren’t as obvious as visible sagging and leaning of the entire home. That’s why you need to be diligent in inspecting your property regularly for foundation damage. So, where to start? You know your home better than anyone else. As such, you may notice those subtle little signs that impending problems are on the horizon. From water damage to ill-fitting windows and doors, be on the lookout for these warning signs that will allow you to catch issues before you have to incur high repair costs – or worse, compromise the safety of your family. Water Damage: Water present in the soil around your home tends to expand when moist and contract when dry. This leads to shifts in the soil, which in turn can lead to crumbling, cracking and even breaking of your foundation. Any cracks that form in your foundation can allow water to pool around it and seep in those cracks. Side note: if you notice your soil is still dry even after a rain storm or watering your lawn, consider this a sign of cracking in your foundation. Floor and Ceiling Damage: Sagging floorboards, warped portions of your ceiling, and gaps between the interior wall and ceiling can also signal damage to the foundation. Do a little DIY test for any floorboards you suspect are warping and sagging. Place a ball on the floor and see what happens. It shouldn’t move. If it rolls, you likely have a problem with the sub-floor or foundation. Ill-Fitting Windows and Doors: Your windows and doors should fit snugly – but not too tightly — in their openings. If they are too loose or too tight, your foundation could be to blame. Of course, this could also be due to improper installation of your windows and doors by the contractor or simply a sign of age. But it’s better to be safe than sorry. Get the issue inspected anyway. Wall Warping: Interior and exterior walls are prone to settling, especially in new construction. Building designs make room for this type of natural settling. So, if you do see cracks or warping in the walls, this is something to investigate further, as it could signal a foundation problem. Be on the lookout for water stains, evidence of mold and signs of decay as well. These red flags can mean water has gotten into your home, possibly via the foundation. Got brick or cement walls? 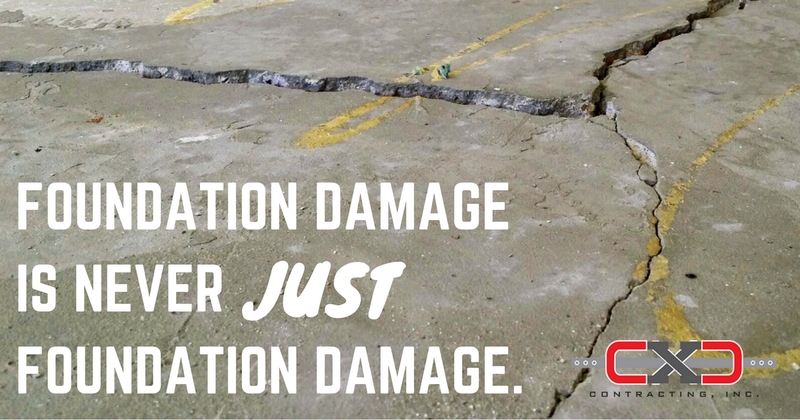 Look for crumbling areas or cracks. If you notice any of the above troubling symptoms of foundation problems, don’t wait for an earthquake to reveal the weakness of your home. Prevent the need for expensive repairs down the line by addressing small issues now. We are the foundation contractor Los Angeles trusts. For a free inspection, contact CXC Contracting today. We can inspect your home for any sign of damage to the foundation and get it fixed before it’s too late.